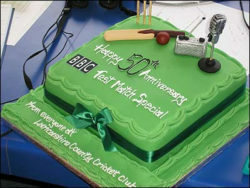 Strawberries, sponge cake or ice cream; a new book on cricket teas is reviewed by former club cricketer ERIC BROWN. Anyone who has dipped a white-booted toe into the social world of club cricket will be familiar with one of its chief lures. Not the prospect of whacking the local blacksmith’s bowling or even sunbathing on the boundary while talented colleagues effortlessly stroke the ball around. Halfway through this quintessentially English sporting activity everything stops for tea. Not just a cup of India’s finest, oh no. Often a full blown feast perhaps designed to reduce physical effort on resumption of play. English cricket teas are legendary for their varied nature, substance and powers of refreshment. Tea almost matured black from being brewed in a silver urn switched on half an hour early accompanies an assortment of goodies to compare with the Savoy Hotel menu. Sandwiches may be filled with ham, cheese and copious amounts of salad – and that’s just one. French bread with cheese, sausage rolls, pork pies, crisps, apples all act as a garnish, if you are lucky. Experienced club cricketers know the best is yet to come. One table will, at clubs who pride themselves on providing culinary excellence, be groaning under the weight of cream cakes, homemade sponge, scones with butter and jam, bowls of strawberries or cherries and perhaps ice cream. These teas are a trap for the unwary. Opening the bowling or batting immediately afterwards is extremely unwise. Strange how availability soars when opponents providing teas like these are next on the fixture card. And how regularly availability drops when the next game is against a club notorious for cardboard sandwiches infested with onions and curled up at the ends, supermarket coconut sponge and undrinkably weak tea. Venues vary too. I recall once retiring to a wobbly, rusty caravan during an Isle of Wight tour match to discover one of the best teas I had ever seen laid out spotlessly and topped off with strawberries and cream. 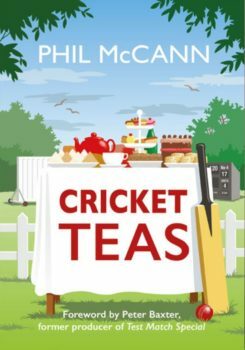 The merit of teas often depends on the number and enthusiasm of tea ladies responsible for it, as cricketer Phil McCann discovered in his book. Phil interviewed some of these ladies, the cricketers who devoured their product and personalities like Michael Parkinson, Michael Vaughan and Jack Simmons for an entertaining journey through cricket cuisine. He even found a Lancashire club who dish up tea time Sunday roasts !